Spike is my favorite Buffy cast member, but he’s a tricky one to handle. You want to keep him snarky, but without ignoring all the soulful character development that’s become part of his history. He’s not an obvious lead, because he’s easier to watch when he’s hanging back, commenting on what the others are doing. That makes him a difficult choice to headline a story, even a limited short-run one. This Spike series takes the problem to the extreme by throwing Spike (and his spaceship full of bugs) into a battle with aliens. Which, no offense, I hated. He’s all wisecracking and everything, but it reads like a bad mashup of Han Solo and when the Hitchhiker’s crew are being thrown out of the airlock by the Vogons. I want to see Spike with humans and vampires, not Predator wannabes. Maybe that’s to come in the rest of the story, but there’s not a lot here to stick around for. The art is competent but not exciting. I’m also not impressed by the introduction of Morgan, a generic tough girl in skin-tight black zip unitard with heels and cocked hip. Anyone reading comics has seen her type too many times before. It’s not in keeping with the richer, more detailed portrayals of women in the Whedonverse. Another thing about Spike that keeps readers coming back is that he has an immediately relatable motivation for much of the comic audience, since he’s in love with the girl he’ll never have. But to make this story stand-alone, there’s not much of that involved. The closest we get is the overwritten narration, an unintentional callback to bloody bad poet William. 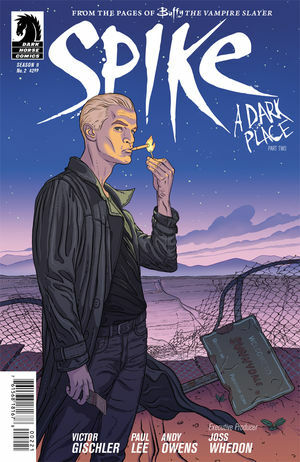 I should stick to my rule of Spike comics: only read the ones by Brian Lynch. He’s the only one who gets the voice and the plot right, in my opinion. This summer, I found out where the insects and their ships came from. They’re in the Spike: Complete Series collection, although they come in late, reportedly due to overall series plans changing as the comics moved from publisher to publisher.